Backyard Cafe, located on street 246 in Phnom Penh has to be one of the best health food restaurants I have been to! Who would have thought that in amongst a nation trying to break out of the third world, that there would be a modern restaurant serving nutrient packed, fresh food at local prices. Backyard Cafe is owned by a British health conscious foodie who clearly saw a gap in the market here in Phnom Penh, and the rest of South East Asia for that matter. At Backyard, all food is ‘clean’, meaning that you can taste every element that is in the dish. Food at Backyard is barely processed, has no added sugar and meals are matched with complimentary food groups and have great nutritional value. Now, I have to admit that health food is often not my thing. This is usually due to the ‘wierd’ food that has been created to supplement meat or dairy products, like mock meat or nut milks and butter. I have a huge problem stomaching food like that, however at Backyard I have found the food to be REAL, meaning that good quality wholesome ingredients have been used to make tasty filling dishes, not strange copies of unhealthy dishes. Backyard utilises the fresh produce of Phnom Penh to make dishes like the Power Bowl or the Pesto Chicken Salad. Backyard Cafe does a mean Breaky, my favourite being the Grilled Garlic Mushrooms with superfood pesto and ricotta and grain bread. This is so wholesome, very tasty and filling! The Quinoa Porridge is also very yummy, however a tiny bit grainy. Backyard Cafe have an elaborate beverage menu, with some of the best smoothies I have ever tried! 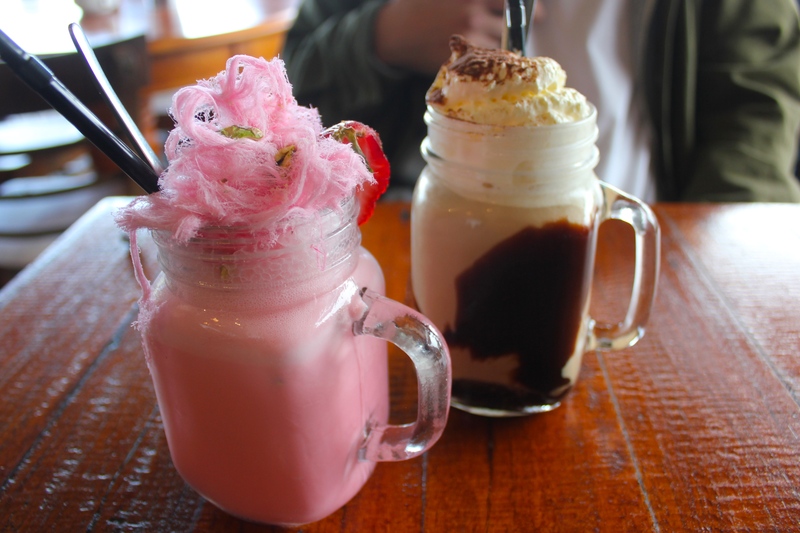 The coffee here is awesome, better than the local ‘Browns Coffee’, I am a huge fan of the iced latte, that is served in a glass jar and has the sugar syrup, and fresh milk in separate glass jars so I am in control of what I want to add to my coffee. I wish we had this option in Sydney, as whenever I order an iced coffee it is usually extremely sweet, or has too much milk. I am also a big fan of the cold pressed juices at Backyard, my favourite being the ‘Earth Roots’ with beetroot, carrot, apple, ginger and lime which is a mere $4! The restaurant is very clean, and modern. It has all the furnishings that you would expect of a yuppie Surry Hills style cafe, with interesting artworks on the walls and long wooden tables. Smoothies here are the best I have had in Phnom Penh, and are served in gorgeous glass jars with a bamboo straw. My favourite smoothie is the Chocolate Protein Smoothie! However my favourite element of Backyard Cafe is their beautiful staff. They are always so welcoming, the service is brilliant, and they are more than willing to have a good chat about what we’ve been up to in Phnom Penh, occasionally offering us some recommendations of places to visit. I only fave very few negative comments to make about Backyard, as they almost always meet our expectations! Firstly, walking up the stairs to the second level at Backyard can be a struggle if you are tall, as the roof stoops down very low and you can easily bump your head. In fact, my friend bashed her head right into the ceiling a few days ago and had to sit eating her food with an ice pack on on her head. However as long as you watch out for this, it won’t be a concern. Secondly, once at Backyard I ordered my favourite pasta-less Lasagne, and it looked beautiful and golden as it arrived at my table. However, it was lukewarm/cold inside, which disappointed me as I love my food piping hot. Thirdly, I am not a huge fan of the raw desserts, especially the Raw Chocolate and Salted Caramel Tart. The ‘Chocolate’ element doesn’t taste of chocolate, but has the flavour and texture of Allen’s ‘Chicos’. However their granola bars are awesome and would be a far more enjoyable dessert option! However these concerns are only minor, and majority of the experiences I have at Backyard have been astounding! Windsor is a place I have always had fond memories of. I see it as a bit of a ‘country’ escape from Sydney city – however its not too far out, it took me about 30 minutes to get too from my house in Sydney’s Hills. I think it’s so important to escape Sydney every now and then for some peace of mind and relaxation – Well let me tell you my afternoon at Easy Lane was one of the most relaxing afternoons I have had in a long time! Ohh my inner asian was thrilled to discover that Hello Kitty Diner had opened at the Chatswood Interchange. I don’t know about you guys, but i’m a huge fan of novelty restaurants – always have been! My first experience of a novelty restaurant, and one in which I hold a high opinion of is Xerts Restaurant. Xerts was a family friendly restaurant that was set out to look like a spaceship. You started by ‘lifting off’ in a spaceship (aka the lift). Once you reached the top, you entered the inside of a spaceship that hovered around the milky way. The restaurant boasted futuristic elements with diner style tables and a computer in your booth to order your food. Now please note, this restaurant was huge in 2000, so computers to order your food on was out of this world – literally! However now that isn’t anything out of the ordinary. This restaurant was a sure treat to visit and was my childhood fave! So as you can see, getting the chance to visit the Hello Kitty Diner was totally up my street and brought out my inner child, and inner asian! The seating, like Xerts, was booth style, and resembled that of an american diner. The restaurant had pink elements everywhere, it almost looked like the air was pink! The food was american diner inspired as well, with an asian flair. For instance, there was a Korean fried chicken burger with kimchi slaw, or sweet potato chips with miso mayo. The miso mayo was divine, delectably savoury, with a hint of sweetness. I ordered what I had seen floating around Instagram – the Hello Kitty waffle with fried chicken and maple syrup. I was a skeptic at first, sweet dessert, with fried ‘dinner food’ didn’t seem like a match made in heaven. However I was pleasantly surprised to find that this dish was so delicious, and perfectly balanced – worth going back for! I wasn’t a fan of the sweet potato fries however, they were sogy and lacked that moorish crunch. 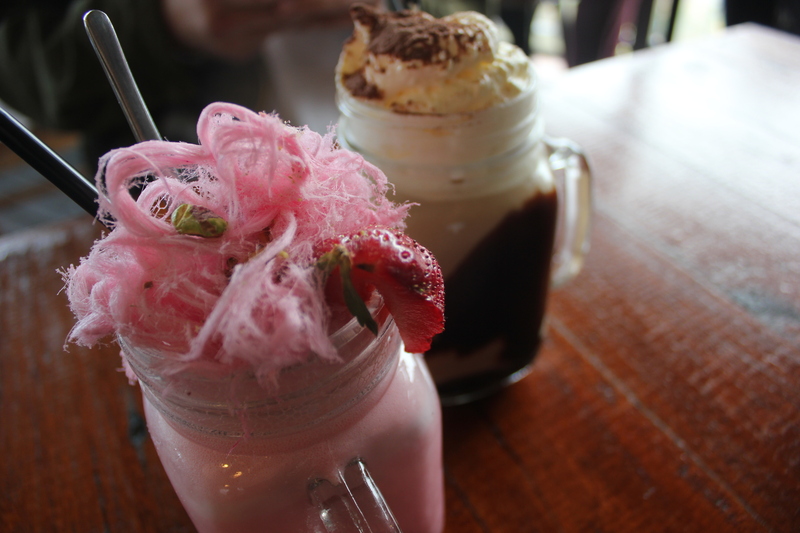 Furthermore, the Hello Kitty Diner soda was way too sweet with no flavour, dont order it! The burgers were okay, just standard burgers cooked well, with a soft brioche bun, nothing to really rave on about. However I do want to go back to try that Korean fried chicken burger that I mentioned before, as their fried chicken and waffles was delicious. Chiswick is located in Sydney’s prestigious suburb of Woollahra. It boasts simple, elegant food that is always fresh and in season. 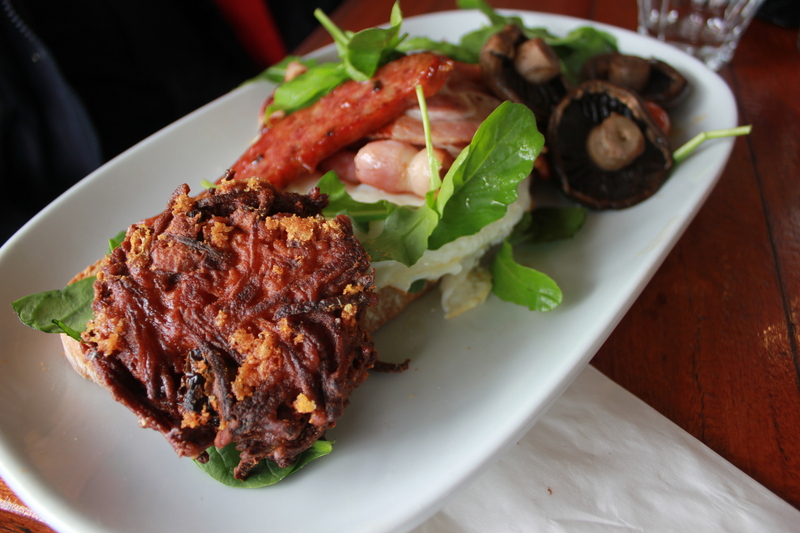 It is modern-Australian food, with hints of French-themes throughout the menu. I remember driving down ocean street and thinking to myself, what is that beautiful property? I saw a long white house, set back on the road surrounded by a massive manicured garden. A while later I was having a conversation with my friend, and she was telling me about a beautiful restaurant in Woollahra called Chiswick. It so happened that that beautiful restaurant was the property that I had driven past a few months before. Of course, I had to visit! A few days later I booked an 8.30 table, to take my Dad out for dinner. There were very few spots available, and it was a Wednesday night! I could immanently tell that if this place was booked out on a Wednesday, it would be good! The restaurant was surrounded with windows, which would make it a perfect location for a lunch date. We were seated near the window and were greeted by a french waiter which was appropriate seeing that the restaurant boasted french elements. Our first course was a Tartare of Beef with a soft boiled quail egg and quinoa chips. I am not a big fan of raw meat, however this didnt taste of raw meat, but that of succulently soft meat marinated in lemon and herbs. It was really delicious! We coupled this starter with a glass of proscecco which was very appropriate seeing that the meat was quite heavy. For the main, Dad chose the Moran family lamb with fresh greens from the garden. I have to say, this lamb definitely delivered on quantity, quality, and flavour! It was so so succulent, falling apart! Even the bone was falling apart! It was drizzled with a fresh mint sauce that was zingy and really went well with the lamb. The lamb also came with roasted carrots topped with Dukkah and labneh – which of course I loved as it paid homage to my Arabic heritage! Finally, for dessert we shared the mango meringue with cookie crumb and mango sorbet! This was light, and has a marsh-mellow texture, perfect end to a delicious, but heavy meal. I would definitely recommend Chiswick as a restaurant full of real, fresh, high quality food. It is not pretentious food in any way, and definitely not fancy like you would get at Quay, Sepia or Est., however it was delicious and perfect for a father daughter night out. The Two Wolves Community Cantina is nestled on the corner of Broadway and city road in Sydney’s city. It boasts a mexican feel, that is very warm and welcoming. The story behind this place is worth learning about. With the idea of urging individuals from the first world to explore the poverty and needs of the third world, the Cardoner Project set out to run immersion projects in poverty-stuck nations, with the aim to motivate individuals to see beyond their own needs, and look to the needs of others crying out for help. The restaurant is non for profit, and all proceeds go towards running these immersion projects. All workers, except the head chef at The Two Wolves are volunteer, and most have themselves been on an immersion project and have been changed by the experience. But don’t think that because the workers are volunteers, that the food would be lacking. The menu has been created and inspired by a variety to popular cafes and restaurants around sydney, with many big names in the culinary industry coming together to make this restaurant a happening place with quality food! I personally enjoyed the Korean fried chicken the most – I would go as far as to say that it was the tastiest fried chicken I have ever eaten! Definitely give this place a try, it is well worth it and is money WELL SPENT! Also check out the post on http://www.rebateszone.com/top-50-food-blogs-in-australia, where recollections of food was rated the 22nd best blog in Australia! For the past few weeks, I have filled days trying burger after burger in search of something quite spectacular. The journey was long however enjoyable (of course! ), and I have discovered that Sydney has some pretty perfect burgers on offer! After my trip to Los Angeles at the beginning of the year, I was inspired by their perfectly handcrafted, burgers; with a soft bun, oozing cheese, crispy bacon and a succulent, thick meat patty. I thought that Sydney didn’t have burgers that compared other than the classic Aussie burger that I grew up with, with bacon, egg, meat, pineapple, cheese, lettuce, tomato and beetroot. But I was so wrong! With the The Fatties burger appreciation society on Facebook booming with 20,000 members, Sydney foodies seem to always be on the hunt for the highest quality burger around – and these foodies are hard to please, they are burger connoisseurs to say the least! But what I can say is after my search for this perfect burger is that Bare Grill Cafe in La Perouse produced my favourite burger so far! The infamous burger is called ‘The Fatties Burger’ created for the The Fatties burger appreciation society. It consists of double beef, bacon, American cheese, gherkins and house sauce for the amazing price of $10. I think the highlight and the secret ingredient of this burger was the house sauce which was creamy, but zesty, and also surprisingly refreshing. The meat was incredibly succulent and the bread was so, so soft! The owner of this place told me that he certainly did his research before opening his own burger shop. 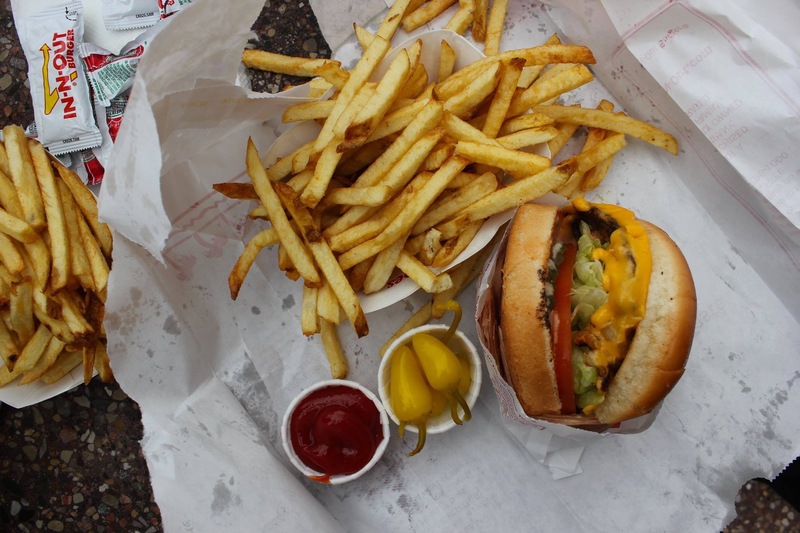 He and his family traveled all around the United States taste testing burgers to find what ingredients were essential to create the best tasting burger. I say that Bare Grill’s burgers are so amazing because they do not compromise on quality, everything is cooked with care and all ingredients are hot and fresh! But wait, there is more! Their new fish burger designed by Simon from http://simonfoodfavourites.blogspot.com.au/ is incredibly refreshing and again high quality! The fish is lightly battered and fried and coupled with coleslaw and a dill and gherkin mayonnaise. If you are a fish lover, this burger is also delicious! And finally, you wont believe it, but as well as producing my favourite burger in Sydney, Bare Grill also have authentic gelato on offer. I would go as far as to say that it is better than messina and Cow and moon, and should be compared more to a very authentic gelato that has a mouse-like texture, much like Rivareno gelato on Crown street in Sydney, or that which I has in Bologna in Italy. Everyone has to visit this place, its worth the drive out to La Perouse, you will not be dissapointed! Thanks to Ompty for inviting me. 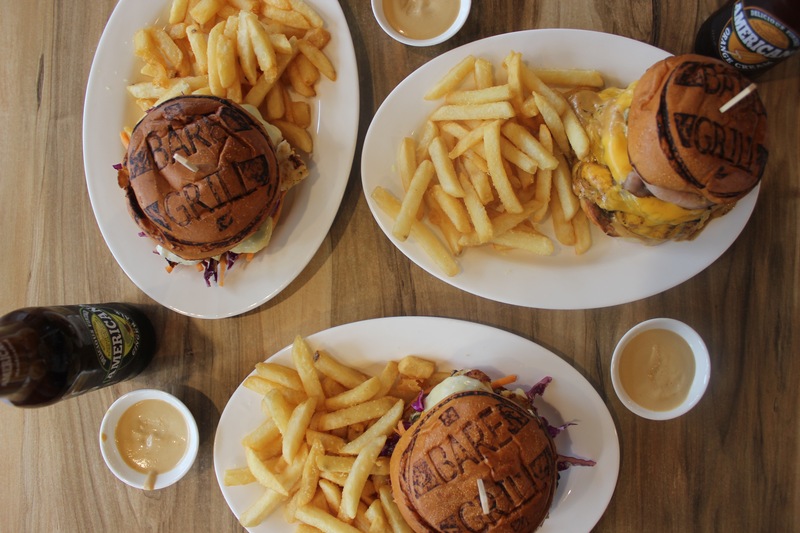 Head over to http://www.ompty.com for some incredible discounts on some of the best Eastern Suburbs cafe’s and restaurants including Bare Grill. 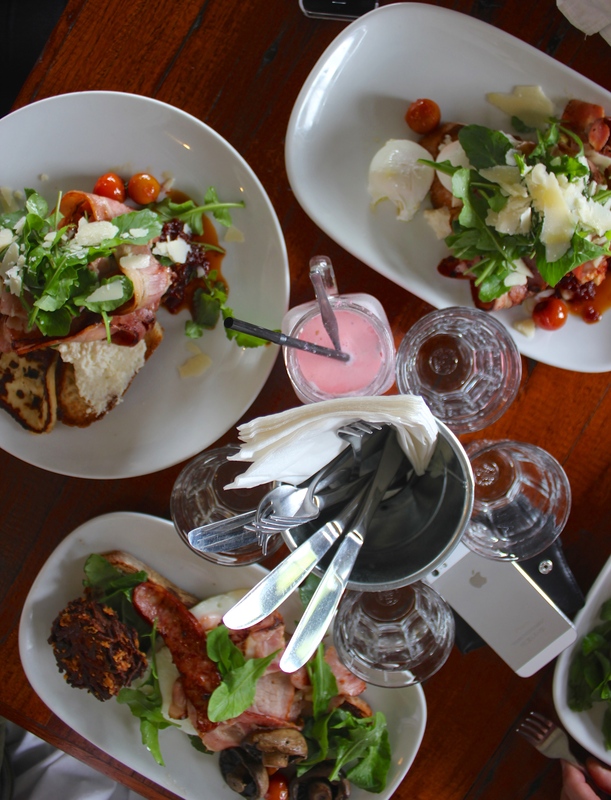 A crisp, cold Saturday morning, with all the family at home definitely was calling for a brunch date at Wild Pear Cafe. Wild Pear is one of my favourite breakfast spots, with its quiet setting amongst the farms of beautiful Dural! 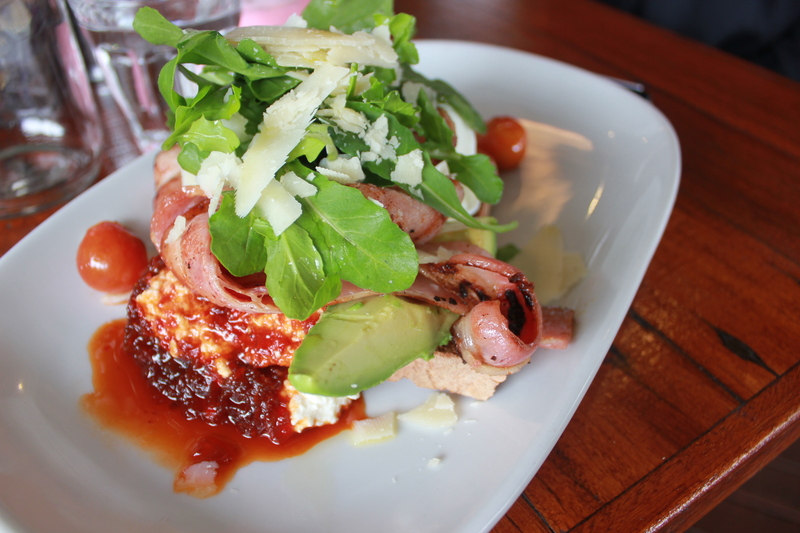 Each time I visit, it is a must that I order the bacon and Avocado stack with chilli jam. Such a simple dish, but so tasty and generous. What I love about Wild Pear is that it is value for money! The serving sizes are huge, but they do not compromise on flavour and quality! I would also go as far as to say that they have some of the best coffee in Sydney. 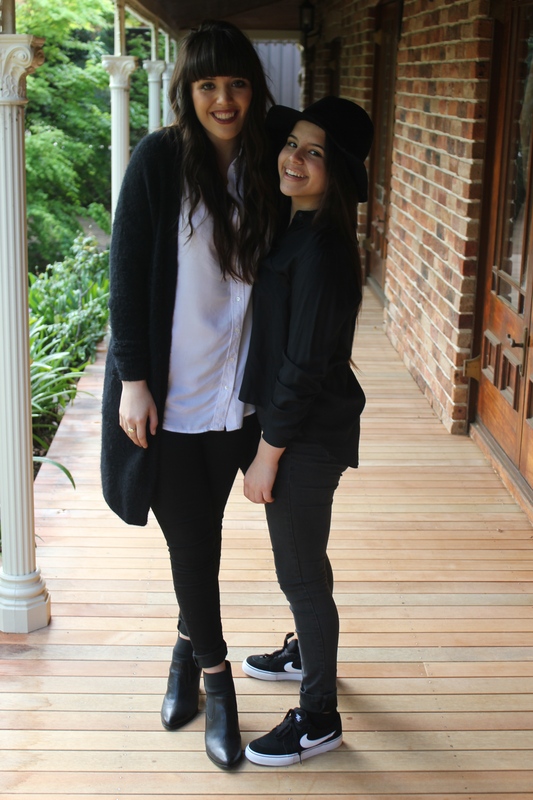 I definitely recommend visiting Wild Pear, especially for breakfast, its worth the drive all the way out to Dural! Hi All! I know I have been MIA for a while, and I apologise for that. I’m hoping to be back in action posting new recipes and blog posts soon. I thought I would post a few snaps of the food from my twenty first birthday for you all to enjoy! 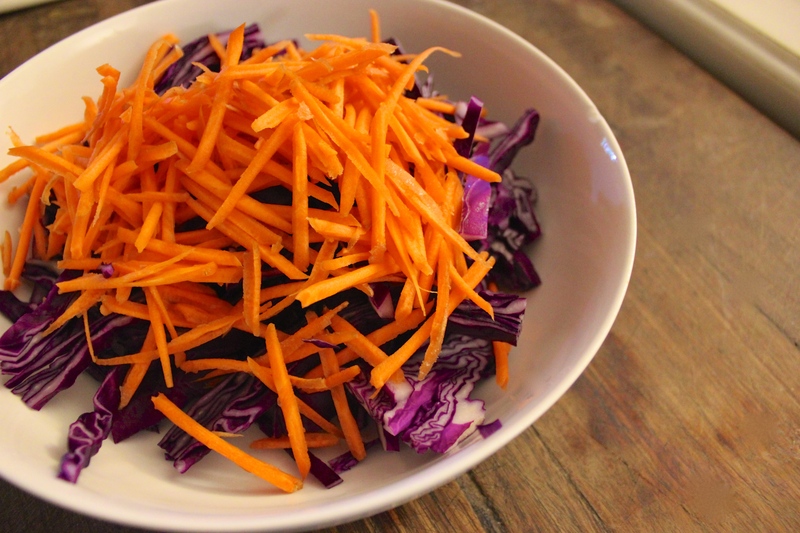 So, in continuing with my salad-loading, tonight I put together a healthy version of coleslaw. To be honest, I have never been a fan of the traditional mayonnaise-based coleslaw. I have always found it too heavy and creamy. However, I love red cabbage and wanted to create a way to eat it that I would enjoy. 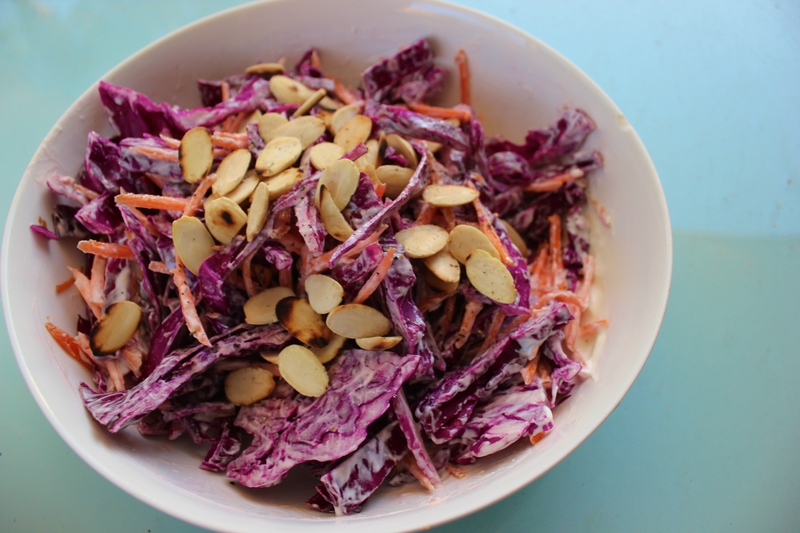 So, this version of coleslaw is delicious! Put the almonds in a pan and toast for a few minutes until golden. Then, mix the salt, white wine vinegar and yogurt together. Toss everything together and serve. This would also be lovely with some smoked salmon or trout layered on top. Enter your email address below to follow this blog and receive notifications of new posts via email. I am a passionate foodie from Sydney, Australia. I love discovering new Sydney-based restaurants to tell the world about! I love being in the know for the next foodie-trend, or food hotspot! I have a passion for the power that food has to transcend, to take me back to a better time. Like the scent of Coco Chanel reminds me of my Mum, food has the same power to take me back to my grandma's kitchen table, or an ice cream bar in Bologna, or perhaps a side street in Spain sipping on some Sangria and gorging on Paella. Re-creating food in my own kitchen at home in Sydney, allows me to re-live treasured memories. So here are my memories, my recollections of food.